Position 2: Opposing/Reinforcing factor (in this case reinforcing), Seven of Pentacles reversed. Learning from failures. Position 4: Conscious influences, what is apparent. Eight of Wands. High energy, adrenaline, advancement, pumped to move forward with life. 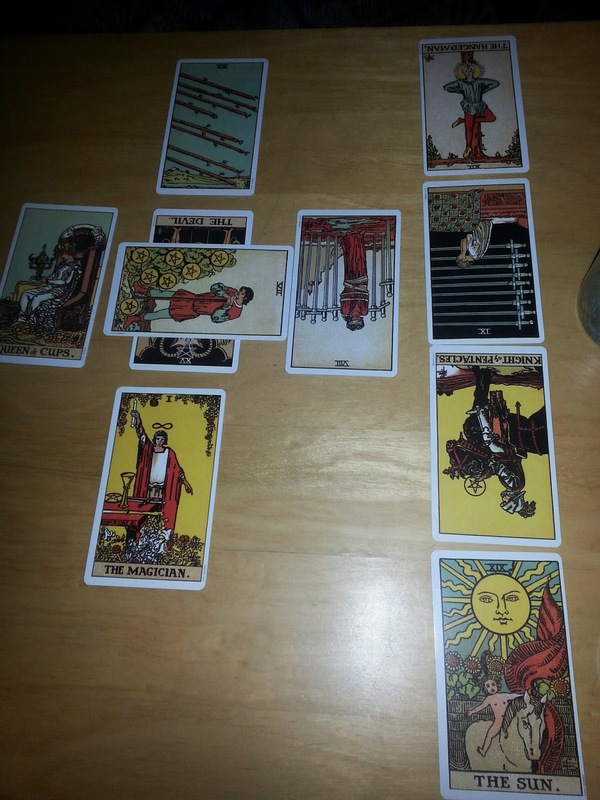 Position 5: Recent past, what is behind, Queen of Cups. Good emotional support and compassion that assisted in breaking free. Position 6: Near future, what is ahead, Right of Swords reversed. New confidence, new thoughts for a new way of life. Position 7: Self image, The Sun. Enlightened, inspired, ready to succeed. Position 8: Surrounding energy, how perceived by others, Knight of Pentacles reversed. A perfectionist, no compromising, zealous. Position 9: Guidance, Nine of Swords reversed. Face fears. Position 10: Outcome, The Hanged Man reversed. Self-righteous. A person coming out of an addictive or enslaving way of life. Focused and intentional about letting go of the old and taking hold of the new. The support and compassion of others has helped this initial attain this initial freedom. They are pumped and on a natural high from the new found freedom and desire to not be enslaved again, and are going forward with new confidence and setting up new habits and ways of thinking to establish this new way of life. They see themself as enlightened and inspired, especially compared to those still enslaved. They see themself as ready to succeed. Others may as them as zealous, a born again evangelist. Moving forward they should be sure to face fears that are deep down and face all the real issues that led to the initial enslavement. Failure to do so may result not only in falling back into old ways but also self-righteousness rooted in a deep insecurity of things not dealt with.